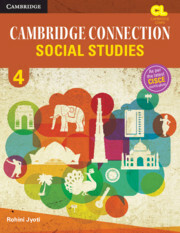 Cambridge Connection: Social Studies for ICSE Schools is a series of textbooks for classes 3 to 5, designed as per latest curriculum released by the Council for the Indian School Certificate Examinations (CISCE). The series gives a basic introduction of History Geography and Civics to prepare the learners for the middle school years where these subjects would be an important component of the curriculum. It includes engaging exercises and activities that link the school environment to the life a child leads in the society. The books in the series have many activities, illustrations and images to interest the young minds. On Your Marks… provides a mind opener warm-up activity. Activity includes in-text activities based on extended learning skills. Think about It! provides curiosity inducing questions or facts. You know what? provides additional information to enhance knowledge of the students. I Learnt provides a summary of the chapter. Words I Learnt provides important contextual terms with their definitions. Get Set, Go! consists of exercises to assess the knowledge of the concepts learnt. Life Skills provide tasks and information to integrate the concept with the 21st century life skills. Connect provides activities and tasks based on subject-integration. Project includes hands-on project ideas.